This is the story of Amazon and Frazer, cousins who have been given the task of tracking down a rare type of Leopard in the forests of Russia. Frazer brings his cousin to America before they head off on their adventure. This is their first time meeting as their Fathers had a falling out years before. Amazon learns on this trip to America all about her Uncles' foundation which is involved in the protection and conservation of rare animals. When they arrive in Russia they head off on their unusual journey which leads them through The Siberian Jungle. This leads to a deadly game of cat and mouse with an injured tiger and a roller coaster of emotions! I loved the style of writing which switched from the human's to the tiger's. It kept it interesting all the way through and there were a few twists and turns along the way to keep the reader interested. The book also has rough drawings every now and again which I really liked. Fans of Eoin Colfer and Derek Landy will enjoy this book and I would recommend it to my friends and relations of similar age. Review by Finn aged 13. 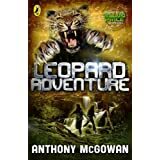 Leopard Adventure is published by Puffin Books.